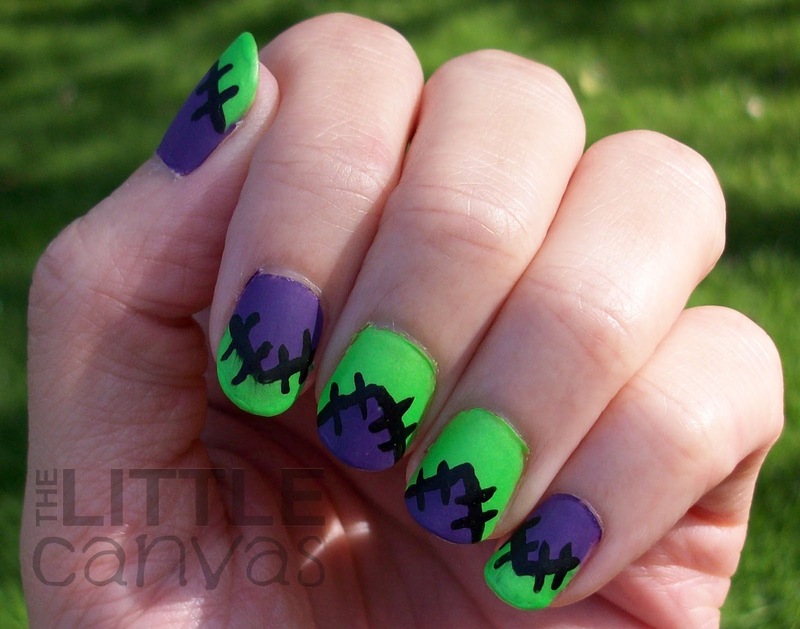 31 Day Challenge - Day 12 - Chevrons - Frankenstein Patchwork! Good Day polished world! Hope everyone is doing swimmingly. Today is Day 12 of the 31 Inspired Days of Nail Art Challenge. Today's theme is Chevron, something which I really have never done before. I did attempt them awhile back, but the colors were all wrong and it was awful. The manicure literally lasted about 10 minutes on my nails, if even. Since Halloween is fast approaching, I decided to start take inspiration from it and start figuring out a way to combine the challenge with this time of year. If my manicures aren't Halloween themed from here until the 31st, then expect them to have Fall colors. Ten bucks bets I will go back on this, I mean, I'm not quite sure how I can do a Halloween saran wrap manicure or jelly sandwich. So we shall see. Don't worry though, I have some super cute manicures planned for Halloween which I will be posting in replacement of the challenge during the week of Halloween. Reason I'm taking a break and doing this is because I don't have time in my life to swatch so many manicures to do both a challenge and Halloween nail art, and well I really want to do Halloween nail art. Anyways, I'm rambling. For this Halloween Chevron manicure, I grabbed all my Halloween-ish colors. Those were black, orange, purple, green, and yellow. I sat staring at them thinking of which would look cool together. I really wanted to use my purple and green so those were a must. I painted on my purple and did my middle and ring finger as accents and was planning on doing black chevron tips. While this manicure probably would have looked awesome, it was a tad boring in my busy, Little Canvas, mind. I remembered patchwork manicures that I had seen on other blogs and on Pinterest and thought "hey why couldn't I have patchwork chevrons?" Thus, the Frankenstein chevron was born. Take a look. To get the look, I painted on the base coats of either Amethyst or I'm With the Lifeguard. Then, with my nail art paint brushes, I painted on an outline the chevron tips. I then filled in the tips with the opposite color of the base. When that was dried, I added the black outline with the nail art brush and added the stitching details. When everything was totally dried, added on some Matte Me Crazy, and called it a day. Pretty neat looking, huh? I was in love with these nails. Definitely eye catching because of the colors, but so neat with the patchwork look. At work, I had a little girl asking me how I was able to do something so cool. When I explained it to her, she had the widest eyes all enthralled....looked at her father and he said "Do not get any ideas!!! Maybe when you're older!" That made me laugh. I also got a lot of people asking me where I got my Halloween nail wraps, which made me feel pretty dang good about my manicure. What do you think?? 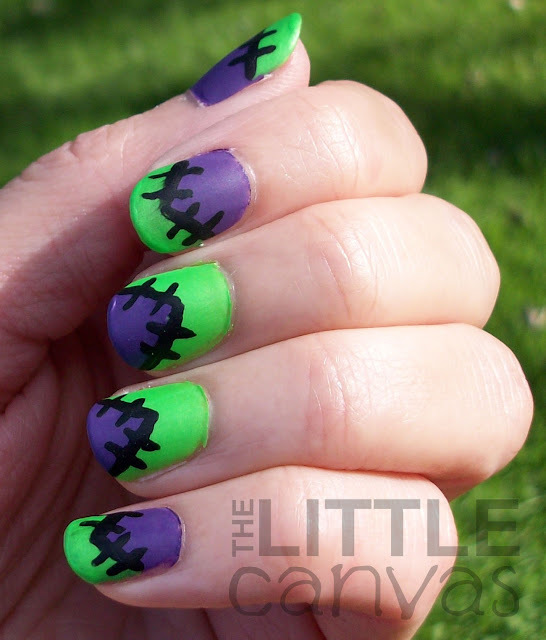 Like the Halloween take on a simple design? As a reminder, this is the challenge. Do not forget to check out the other lovely ladies! 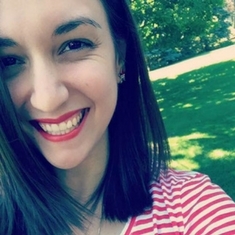 Nicole from Polish Me, Please! 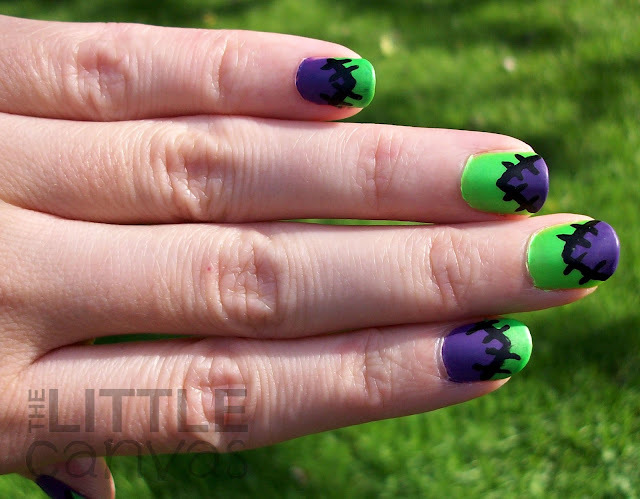 Guest Post - A Halloween Pedi!